A flock of sheep, a bunch of LEDS, some well trained sheep dogs and fast-motion video. Welsh hill farmers show that those in the land of their fathers can excel in fields other than ones with rugby posts in them. A group of Welsh sheep farmers have become internet sensations after a video went online showing sheep being herded into astonishing shapes on a mountainside. Matt Smith, the co-founder of ad agency The Viral Factory said: “The people on camera are real farmers and they were really controlling the sheepdogs. Rather than trying to fake it all we did it for real. “The sheep herding bit is straight up – no trickery but there is a fair amount of computer trickery and post production work. “We thought the Mona Lisa was the big wink to people – once they saw that we thought they would realize it was not all real. Mr Smith said the main problem on the shoot was not herding the sheep, but getting enough of them. He went on: “We filmed it at the end of last month and it is lambing season so we could not disturb the sheep that were lambing because it would have been too stressful. “We used different sheep over the two day shoot because we couldn’t have them running around all day. We didn’t give them any treats because they got to wear an LED coat – I can’t think of anything better. LED Art is form of light art constructed from light-emitting diodes. 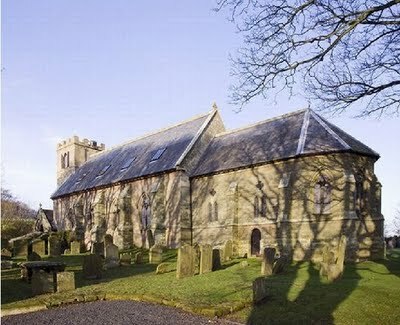 A nondescript exterior and a yard dominated by headstones give no indication of the residential nature of this historic church in Kyloe, Northumberland. A couple decided to purchase and re-adapt the structure, investing nearly three times the purchase price into renovations over the course of several years. The exterior remains mostly untouched, save for skylights running the length of the roof. Inside, the owners took a similar approach. Restoration is more prevalent than renovation, with original stained glass windows throughout, and church fixtures abounding. 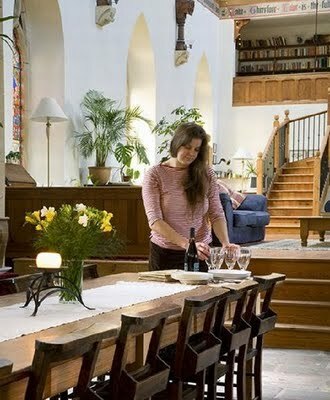 Much of the original seating in the church was refinished and placed throughout the home, and unused wood and building materials were fashioned into a dramatic staircase leading from the main living space to an upper level library. The choice to live in a church is an unorthodox one, but this home’s owners managed to salvage a structure that might have otherwise been doomed to deterioration. 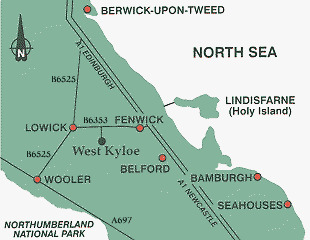 Kyloe parish lies on the coast of north Northumberland overlooking Holy Island. It rises from the shore westward to the Kyloe Hills. Here, there are rocky crags where Iron Age settlers built their homes. Elsewhere, there is a mix of arable farming and forestry plantations. The St. Nicholas Church was built in 1792 on the site of an earlier church dating from around the 1100’s, it was deconsecrated in the 80’s after which it stood derelict for around 20 years. Taken on as a conversion project in 2002, it is now completed and listed at approx. $1.3 million USD. A deconsecrated church is a church which is no longer used for worship. There are several reasons why a church may be deconsecrated, such as damage to the structure rendering it dangerous or impossible to use, changes in parish structures or the population in the area, or simply that it is no longer practical to use it for some reason. St. Nicholas Church House in Kyloe, Northumberland, is an impressive Grade II listed Georgian building, dating from 1792 and constructed of dressed stone. It features a prominent west tower with battlements as well as stained glass by Clayton & Bell, whose windows adorn many of the country’s largest ecclesiastical buildings. When pilot Ian Bottomley and his partner, Sally Onions, a bookkeeper, first saw the church ten years ago it was already in the early stages of conversion. Planning permission had been secured for a change of use to a craft centre with accommodation above, but the owner was struggling to cope with such an ambitious project and had decided to sell. Ian and Sally each owned a terraced house in Northumberland, and sold one of these properties to fund the purchase of the church. Their first task was to remove all of the ugly breeze block partition walls and the new first floor, which divided the beautiful stone mullioned windows in half. All of the blocks were then carefully cleaned and reserved for future use to help reduce costs. Ian has a background in computer graphics and created a 3D model of the church, which allowed the couple to take a virtual tour around the interiors. They then presented their final design to a local architect specialising in historic buildings, who tweaked the plans ready to be submitted for planning and Building Regulations approval. Various organisations needed to be involved, including English Heritage and the Church Commissioners, and the initial design stage took almost two years to complete. The main body of the church has been left open and incorporates the chancel, nave and vestry. This space includes living, dining and kitchen areas, with new stairs rising up to a galleried library at one end. A separate kitchen and sitting room provide more modest winter quarters for Sally and Ian, who were aware that heating the entire church year-round would prove impractical for just two people. Initially, the most pressing task was to weatherproof the listed building, a process which included replacing a missing window, eradicating damp and employing a company to strip and repair the huge roof. Around 80% of the original slates were suitable for reuse and externally the church remains virtually unchanged. Inside, a huge concrete raft was poured, with friends helping out — fuelled by pizza and beer and supervised by Ian’s father, a retired builder. For six years the couple laboured on the church, insulating the building, fitting conservation rooflights and installing underfloor heating. A wooden floor has been laid in the nave, and the stone aisle was taken up and used to patch an incomplete flagstone floor in the chancel. The church porch opens into a lobby situated within the tower, complete with a stone flagged floor and original baptism font. 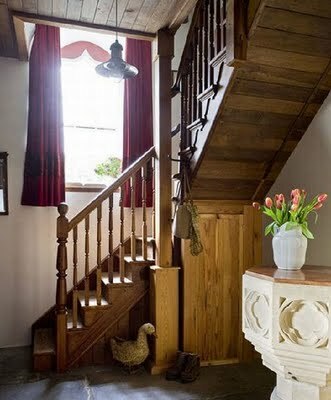 An inner hallway with Brazilian slate flooring passes the winter kitchen and sitting room, which features a carved stone cross thought to date back even earlier than the church. 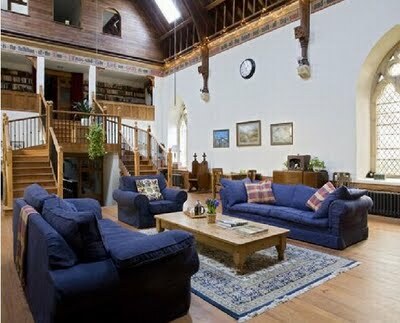 Steps lead up to the impressive full-height living area, which has an open timbered ceiling and a tinplate frieze on which a psalm has been painstakingly hand-painted by a former vicar’s wife. Lit by stained and clear glazed stone mullion windows and the new conservation rooflights, the 35-foot-high space is heated by underfloor heating backed up by cast-iron radiators. Care has been taken to ensure that the main architectural features have been retained and, where appropriate, fittings have been sourced from other ecclesiastical properties. Finding suitable items became a virtual obsession. “Doors are out of a school in Manchester and the wainscot panelling around the living room came from a chapel in South Wales, and was probably our best find,” says Ian, who hand-built the impressive staircase leading up to the library using roof timbers from a hospital in Bradford. He also crafted the vestry kitchen from reclaimed pitch pine using pew frames, with worktops made from old pew seats. Repairing between the rafters uncovered some slivers of vivid blue plaster, which Sally and Ian took to be colour matched. 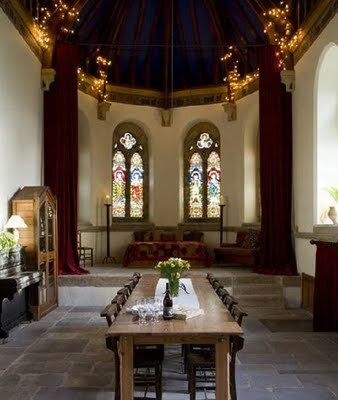 They have reinstated the striking blue ceilings above the vestry kitchen, the chancel dining area and the open plan altar bedroom, which is lit by four stained glass windows and may be curtained off from the main body of the church. Once the interiors had been completed the couple turned their attention to the churchyard, which extends to almost an acre. Permission was granted by the Church Commissioners to move some of the gravestones against one wall of the church, creating a private lawned area with sweeping coastal views. When a church is no longer required, it becomes a ‘Redundant Church’ . Planning permission is normally required for a change of use, and listed building consent may apply. You will also need to submit your plans to the Uses Committee Secretary. If there is a graveyard attached to your church, the human remains must be removed and interred elsewhere, although if your plans will not disturb any graves the Home Office can grant an exception. From the outside, St Nicholas church in Kyloe, Northumberland, looks just as it did 100 years ago. So much so that the owners who converted it, Sally Onions and Ian Bottomley, have put a sign outside the gate saying that the building is no longer a church, but a private home. Now a five-bedroom house, it is for sale for £650,000 through Smiths Gore. 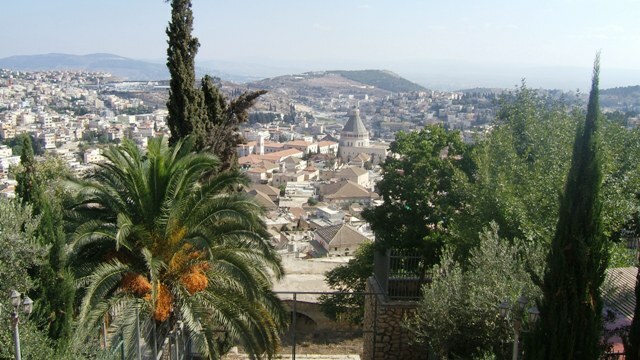 The Georgian church, which the couple bought in 2001, is in a heavenly position. It is said by Pevsner to have been built by George Robinson and Thomas Hindmarsh in 1792 and has a Saxon cross in the churchyard which pre-dates the building. A number of the stained-glass windows are by Clayton & Bell, whose creations adorn several large ecclesiastical buildings, including Peterborough Cathedral. A previous owner had begun to convert the church, but they reckoned what he had done was badly conceived, so the couple ripped it all out and started again. “The saddest thing was that the stained-glass window depicting St Nicholas ended up stuck down a corridor in the loo,” says Sally. Sally, who is a bookkeeper, and Ian, a pilot, spent every free evening and weekend turning the church into a fabulous home with a voluminous living area, incorporating the chancel and nave and stretching 31ft up to the apex of the roof. 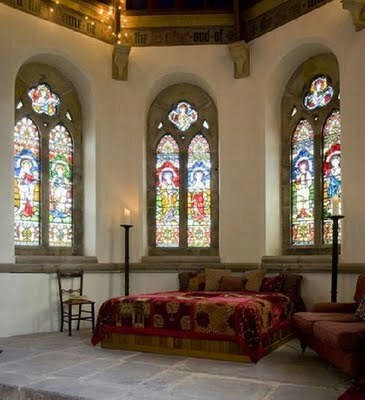 At the far end, beneath four stained-glass windows and where the high altar would have been, is a double bed. There are two bedrooms on the ground floor and three in the tower. Ian did all the woodwork – every lavatory seat, cistern cover, cupboard door and even the split stairs to the galleried library and rear rooms are his. Sally worked on all the travertine and Brazilian slate tiles. They also laid the underfloor heating and pitch pine flooring in the living area, and relaid the flagstones. “It only took us a couple of days,” says Sally. “My mum was a wonderful help. She trimmed all the rough edges while Ian and I put them down.” In fact, the couple did everything themselves except the plumbing, the roof, the steel work (taken on by Ian’s brother) and the plastering. The only items left in the church had been the stone font and pulpit. The couple have left the font in situ, but dismantled the pulpit and stored it in the garden, where it lay in pieces for several years. “When we came to put it together, it was like a jigsaw. We had numbered the pieces, but these had washed off over the years,” says Sally. “For ages we thought we were never going to get the job finished and often wondered what on earth we were doing. But once we’d started, we had to carry on. “The worst thing was waiting to get permission for the top of the tower. The planners wouldn’t allow us to put in windows behind the louvred openings. We did the two floors below – making a dressing area and two bedrooms and applied again four years later. This time they said yes.” Now there is a sweet little bedroom at the top with the best views of all. During the time of building the house, Ian sold his share of an IT business and re-trained as a commercial airline pilot. He is now flying for Scottish airline Loganair. Kyloe is a quiet hamlet six miles from the coast, 10 miles from Berwick and a few minutes from Belford. 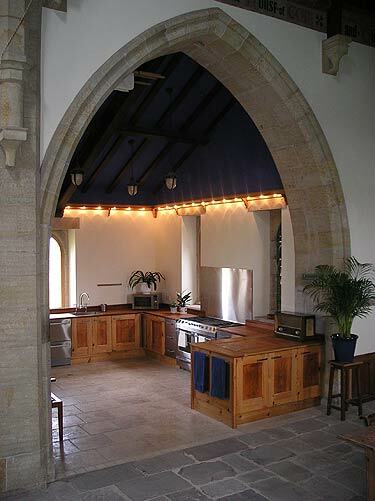 At the heart of the home is the breathtaking full- height open-plan living area, which incorporates the chancel, nave and vestry and has stone mullioned windows all around. This huge room, which has cast iron radiators and underfloor heating, serves as a living, dining and kitchen space. 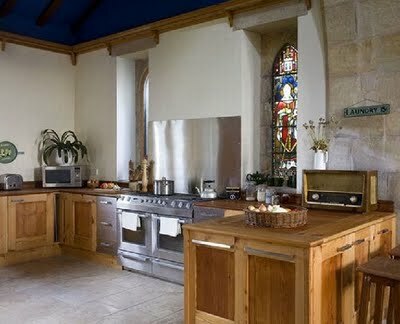 The former Vestry is now the backdrop for a bespoke kitchen. 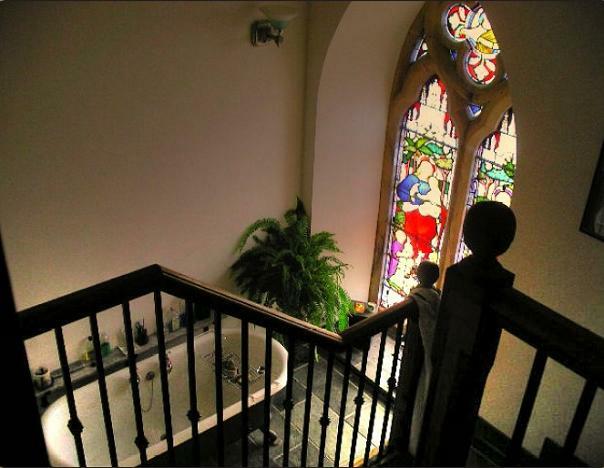 Steps lead from here to the fourth bedroom within the former High Altar, which has five stained glass windows. Also on the ground floor is a further winter kitchen and second lounge/fifth bedroom. This room has a multi-fuel stove and stone-carved Saxon cross, which pre-dates the church. Two staircases lead to the first floor from both the entrance hall and main open-plan living space. 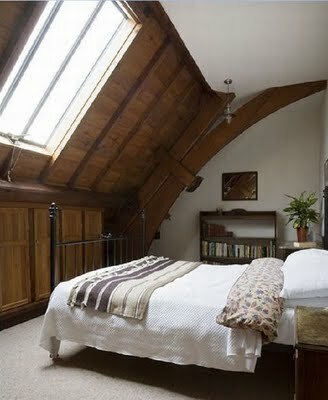 Above is a galleried library and shower room. On the second floor are two bedrooms with timber roof trusses along with the stunning tower bedroom suite, within the former bell tower. A lobby opens to a dressing area with steps up to a further third floor bedroom boasting spectacular views on three sides. For those who want to develop the property further, there is even planning permission to convert a detached stone outbuilding into a two-bedroom cottage providing 781sqft of accommodation. 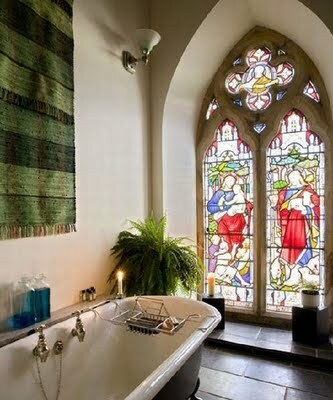 This would be ideal as a granny/nanny flat or holiday let – something Ian and Sally didn’t have the energy for once they’d finished the church. Now the couple are hoping to move closer to Glasgow airport where Ian has been based since becoming a pilot three years ago. “I spend most of my time going up and down the A1,” he said. “So it’s not ideal. In some ways it’ll be a wrench to leave as we put so much work into it. “But in other ways it’s a relief it’s over! 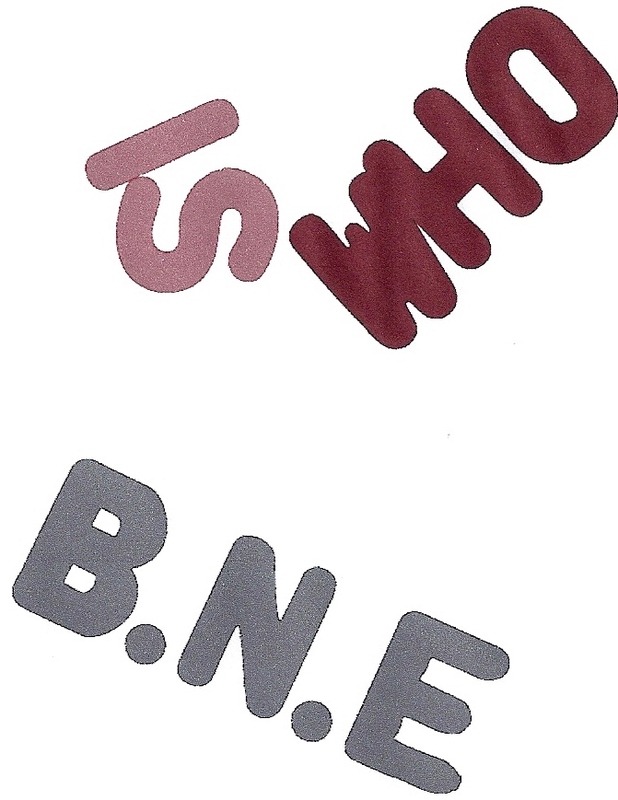 The mysterious B.N.E. fella surfaces. BNE, a graffiti artist known the world over for blanketing entire cities with his tags, is coming to New York for a showcase, with the help of Mother New York and culture blog Animal New York. The Philippines has been labeled the second most dangerous place for journalists, next to Iraq. More than 34 (some articles state the number as 18) journalists were massacred on November 23, 2009 in the Philippines. 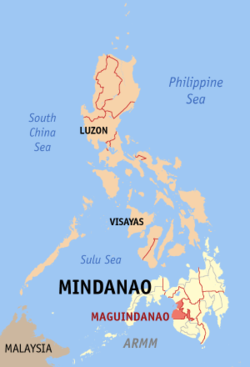 The Committee to Protect Journalists has called the Maguindanao massacre in the Philippines the single deadliest event for journalists in history. 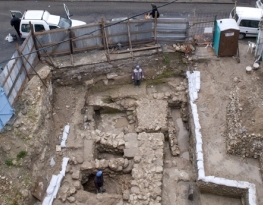 Two days before the incident, the mass grave was prepared using a backhoe. We are no longer who we were before Monday. In the annals of political violence in the Philippines, there have been no parallels to the slaughter that occurred on the lonely road to Shariff Aguak, Maguindanao on November 23. 57 unarmed civilians all, the majority of whom were media professionals, most of the victims were enroute to perform basic functions in a civilized democracy: the Mangudadatu women were to file certificates of candidacy; the lawyers were to provide legal advice; and the journalists were to bear witness on behalf of the public and to report on an important event without fear or favor. All of these roles are essential for a political system where power is meant to be transferred without violence. What met them in a town recently renamed Ampatuan was the exact opposite: a force and mentality that invoked the barbarity of more primitive times. The crime that occurred in Ampatuan was uniquely savage, but it was also an extreme example of the violent tendency in our politics. At the other extreme are the many citizens who are bravely committed to the difficult and complex process of peacefully deciding who our leaders should be, such as those souls who perished on Monday. It is this tension between savagery and peaceful process that has marked our electoral history. Those are the most critical choices in 2010. Much will depend on how the government reacts in the coming days. For what is emerging is evidence that the assailants were not outside the law but part of the political machinery of local officials backed by the Arroyo administration. The President so far has ordered a thorough investigation and declared a state of emergency in Maguindanao, Sultan Kudarat, and Cotabato City. Philippine National Police Director General Jesus Verzosa has relieved six PNP officials in Maguindanao. We trust that this is just the beginning of a series of actions that will bring all of the perpetrators to justice, including the warlords who orchestrated this bloodbath. If they are permitted to escape harsh punishment, it will clearly be a vote for barbarity and for the other savage armies prepared to assault our maiden automated elections. As we wait for action, we grieve. We grieve for the believers in a democratic system who paid with their lives. We grieve for the martyred journalists who believed the Constitutional protection of their rights was enough. By travelling without arms to perform their democratic duties in hostile territory, the 57 made their choice. We honor their example and sacrifice, as their fate continues to chill our bones. As fellow believers, we could have easily been them. SHARIFF AGUAK – (UPDATE ) A key suspect in the gruesome killings in Maguindanao province and member of a powerful clan in Mindanao has surrendered to authorities and would be flown to Manila. Datu Unsay Mayor Andal Ampatuan Jr., son of Maguindanao Governor Andal Ampatuan Sr., has been identified as having masterminded the massacre last November 23 that claimed the lives of at least 57 people, including 18 journalists who were supposed to cover the filing of candidacy for governor of the Ampatuans’ political rival, Buluan Mayor Esmael Mangudadatu. We usually think of journalists who are in war zones as being in danger; that isn’t always (and only) the case. Journalists’ lives are in danger – all over the world. At least 1 in 7 people in the world cannot read. 776 million adults are illiterate. 75 million children are out of school. 30 million adults in the U.S. possess below-basic literacy skills.